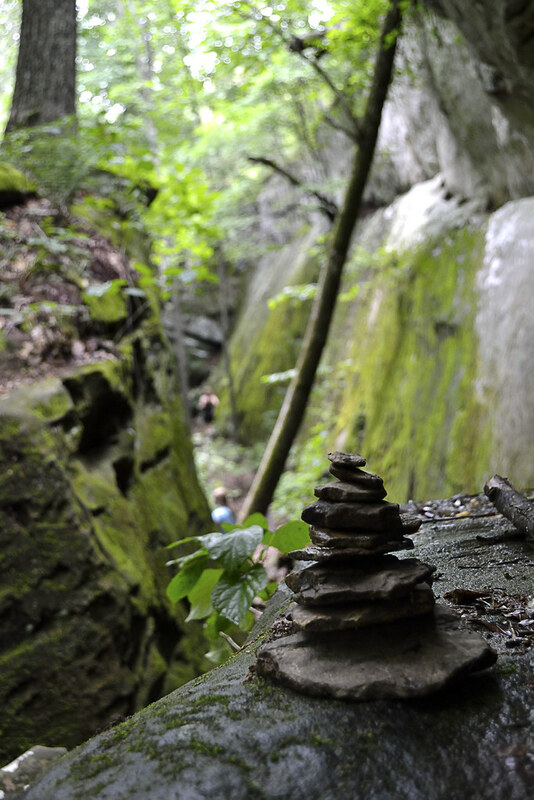 Local Treks: Hiking Missouri and More: Panther Den: Don't Forget Your Map! Panther Den: Don't Forget Your Map! 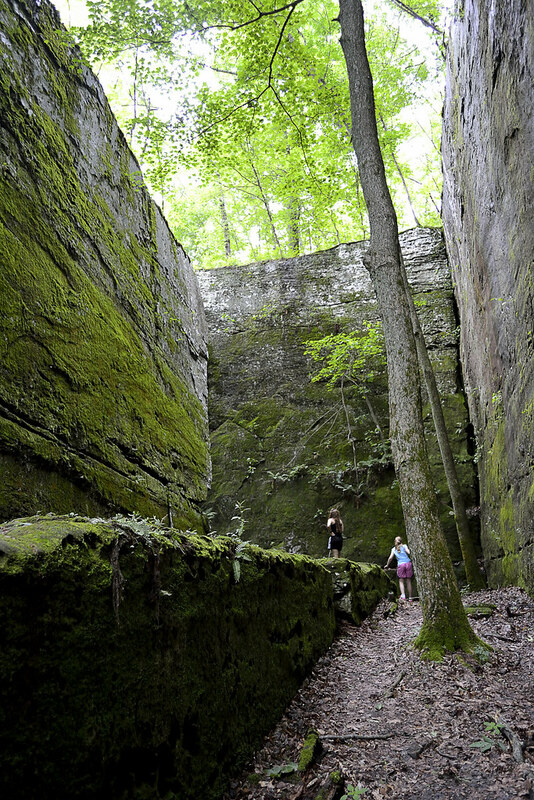 Panther Den Wilderness may be the smallest wilderness area in the state of Illinois, but it packs in some of the most distinctive and maze-like rock formations you may ever see! 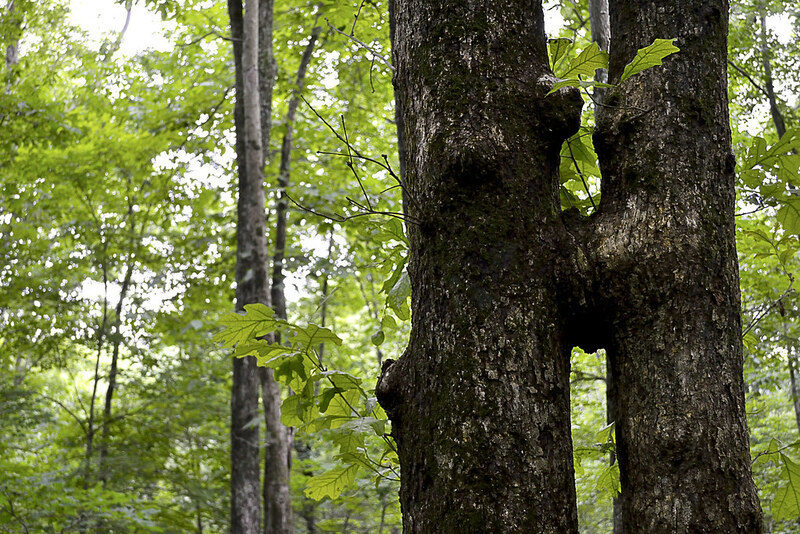 This distinctive and unique area boasts over 820 acres of land and is bordered by Crab Orchard Wilderness, which offers an additional 4050 acres of Illinois wilderness to its north. Before you read on, you may want to brush up on Wilderness Areas (Let's Get WILD) is and print yourself off a map of the area. 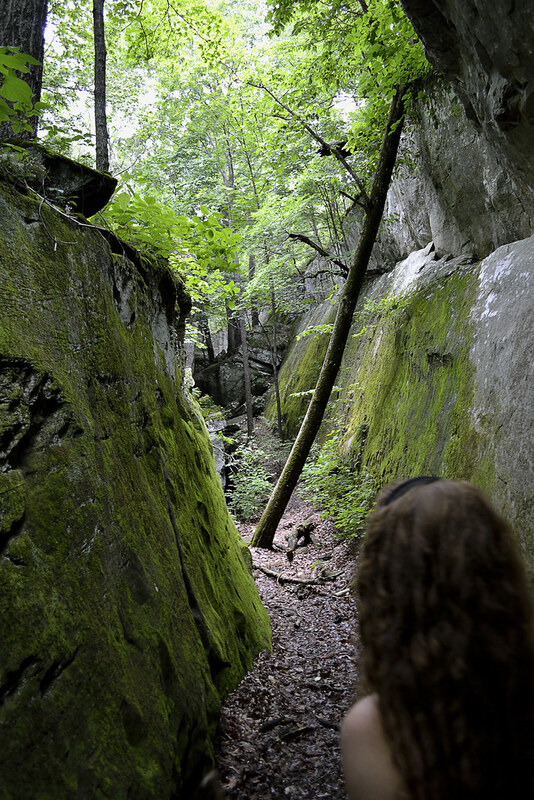 Finding Panther Den Wilderness may be, in itself, a bit of an adventure. If you have been searching for directions I'm sure you've encountered a thousand different versions out on the internet. Some talking about private land others talking about washed out creeks, heck some may even be saying you'd better just float on in from the north on one of the fingers of Devil's Kitchen Lake. I guess I'll go ahead and add another way to get there, ours was simple and fairly straight forward. Panther Den LANE on the left. You'll notice this road is in pretty rough shape (or at least it was in 2013-14), keep to the right as it is a one lane road, and you will see the parking lot at the end of the road on the right. and the River to River Trail is 001. See the Quick Trail Note below. The trail itself begins as a mixture of gravel and dirt, featuring many planned switchbacks which help to reduce the wear and tear of erosion on the trail and wilderness. The switchbacks also make the hilly terrain a bit easier to traverse. The rolling downhill hike will bottom out with a small creek crossing, be alert here as we have found this a fantastic place to find local wildlife visiting for a refreshing drink. From here you'll travel up a small hill be sure to veer left at the trail intersection and that will take you to a welcome sign for the area. You can now follow the trail around the Panther Den or, better yet, go inside the magnificent sandstone formations for which the entire wilderness area is named! The Panther Den loop makes use of the 389 white diamond trail markers/blazes, however these markers are sometime sparse and, I suspect, stolen by idiots. 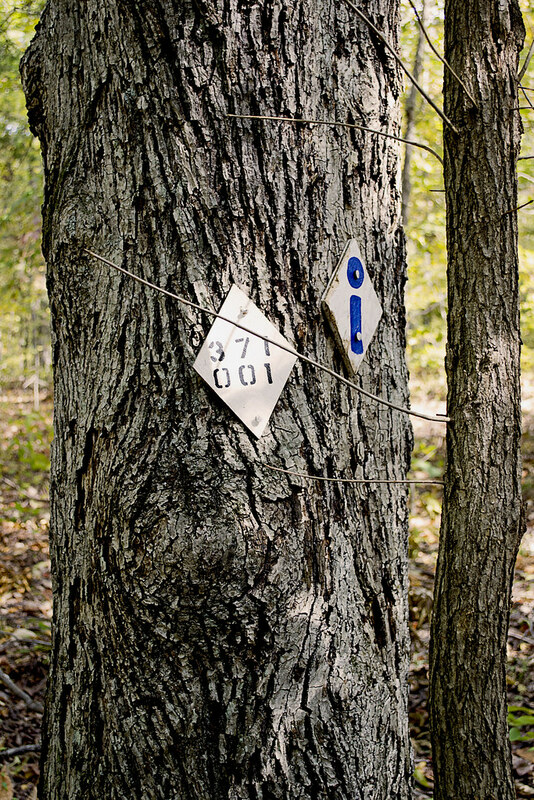 Youmay see markers up for 389-A and 389-B, both of which are small spurs, these spurs seem to be old, abandoned trails. My experience is that 389-A and 389-B are generallyovergrown and hard to navigate (I became pretty lost on what I believe now to be 389-B). I'd suggest staying on the main 389trail and then following the 371 trail marker back to the parking area. 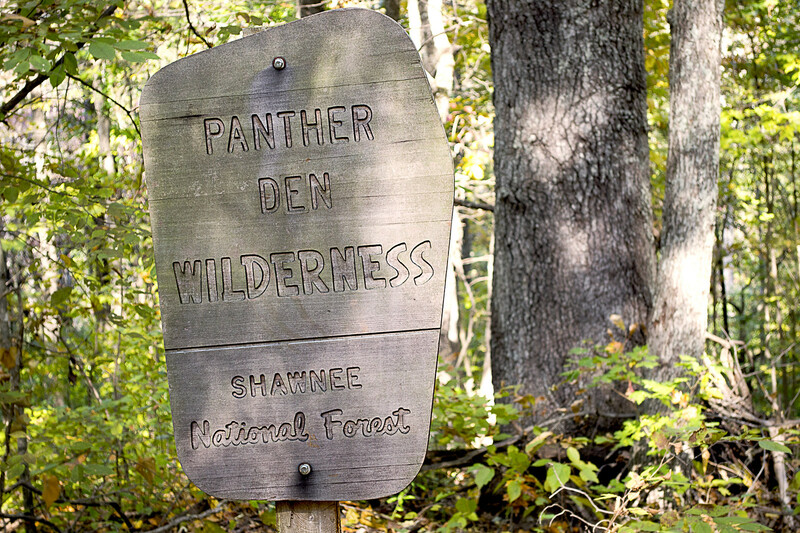 001 is the designation for the River To River Trail, which runs through and connects Panther Den Wilderness and Crab Orchard Wilderness. Inside Panther Den, you'll find these huge sandstone formations seem to form rooms, hallways, and even floors. Some of these formations are so angular that you may have an "Ancient Aliens" like feeling, wondering if perhaps some ancient astronauts visited the area eons ago in order to lay down rock foundations and rooms to inhabit. One particular "room" in Panther Den seems to even have a poured foundation. In reality though, aliens didn't have anything to do with it, all of the formations are natural... Or are they? You can easily spend hours inside of Panther Den, leaping from cliff to cliff, poking into every crack and crag, squeezing through narrow crevices and splits or just running your hands over the smoothness of the sandstone. There are small waterfalls to be discovered, side trails to be explored, cairns to be constructed and plenty of places to hide as well; so you can jump out and scare the wits out of your friends and family. And, although you won't find any panthers in Panther Den (at least not sincethe 1870's) you may spot some other local wildlife such as whitetaildeer, turkey, muskrats, beaver, and skunks. If you are really lucky, you may even get a rare glimpse of a bobcat or mink. So be sure to keep your eyes peeled! Be sure to set a meeting place up. You will also find many sandstone "coveys" carved into the rock in the area around Panther Den. These sandstone overhangs offer shelter to an uncommon wildflower, French's shooting star (Dodecatheon frenchii). Unfortunately we didn't spot a single one on any of our hikes. But, ifyou would like to see or find one I would suggest hitting the area inMay or June and seeking out sandstone overhangs near running water.Although the French's shooting star is not currently on IllinoisThreatened and Endangered list, it is still considered a sensitivespecies in the state. So if you are lucky enough to find a colony of these beautiful little wildflowers, please take only pictures so thatothers may be able to enjoy their beauty as well. You may also want to stick together while exploring the inside of the formations, or at the least set a place and time to meet up in case someone gets separated. It is very easy to get lost within the maze-like formations of Panther Den. Children (andparents) may freak out if they suddenly find themselves separated fromthe rest of the group. If you become horribly lost remember that a distress signal in the woods consists of three successive sounds; be they yells, shots, claps, whistles, or any other signal. There is so much to be explored in Panther Den that you may even consider camping within the area. If you do, remember that you are within a wilderness area. You do not need a permit and the US Forest Service asks only that you practice "Leave No Trace" ethics and camp a minimum of 300 feet from any established trails. Most of the "user" camps that you will encounter are far too close toestablished trails and have left obvious marks on the landscape. You are encouraged not to use these campsites so that theseoverused areas may recover. Of course, you may want to read up on what a wilderness is and always remember to practice your very best Wilderness Manners. Now that I've told you of how beautiful and truly distinct Panther Den Wilderness is, I'd like to give you two quick stories of warning. On our first outing at Panther Den Wilderness we became lost. Very lost. Playing victim to many of the "trails" as we ventured further into the wilderness. We had inadvertently stumbled upon an old, abandoned equestrian trail that twisted and turned through rugged terrain. As I continued to notice the decline in the quality of the trail, I became (silently) alarmed. I could tell we were no longer on an established trail and we had taken so many lefts and rights, I could not recall from which way we had come. Luckily I had my phone, turned off, in my pocket. No bars. We continued to hike and I continued to quietly check my phone. A bar lit. I stopped and instantly hit the button for Google Maps. Once it loaded I found our heading and took note of where the trailhead was on that small, smart phone screen. Had it not been for that stroke of luck we may have been lost for hours in Panther Den Wilderness. This is the experience that taught me to never, ever, set out on a trail without a map and an idea of the route I wish to travel. On our second visit to Panther Den Wilderness we made our way down the gravel road toward Panther Den Wilderness, when we noticed a man wandering aimlessly nearly a mile from the trailhead. It was apparent to me that he was lost and I slowed down to see if he needed any assistance. 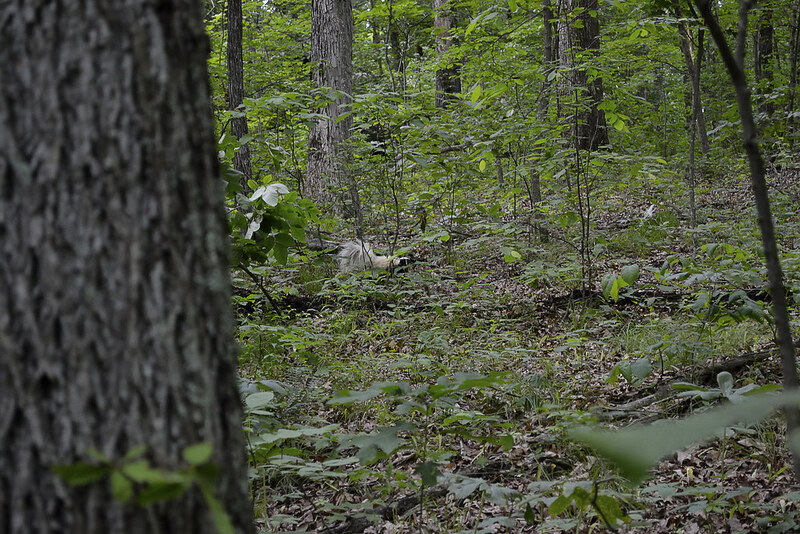 He sheepishly admitted to us that he too had fell victim to one of the "false" trails of Panther Den and as we drove him back to the trailhead, he told us he had been wandering for hours, without a phone or map, happening upon the road by pure chance. I could tell he was embarrassed, as I had been just a few months prior, of becoming so lost. He was an outdoorsman, confident in his abilities to maintain a heading and follow a trail, it was this over confidence (which I too had suffered) that led to his unintended side adventure, and his catching a ride with us back to his truck. His last words to us were, "I can never let my wife know about this." So now, please, take this map. Print it. Fold it. Put it in your pocket. It's simple. If you plan tovisit Panther Den Wilderness and truly explore the area I cannot stressthe importance of having a map on hand enough. Safely experiencing the beauty and sheer uniqueness of the area is worth the ink! CLICK HERE AND PRINT THIS MAP! Wilderness Areas: Let's Get WILD!